Our Kids Class is run by our Senior Instructor Mal McRae (6th Degree Black Belt) with Assistant Instructors David Lane (1st Degree Black Belt) and Lindy Wilkins (4th Kyu Aikido & 3rd Degree Black Belt in Karate). All instructors have Working With Children checks. 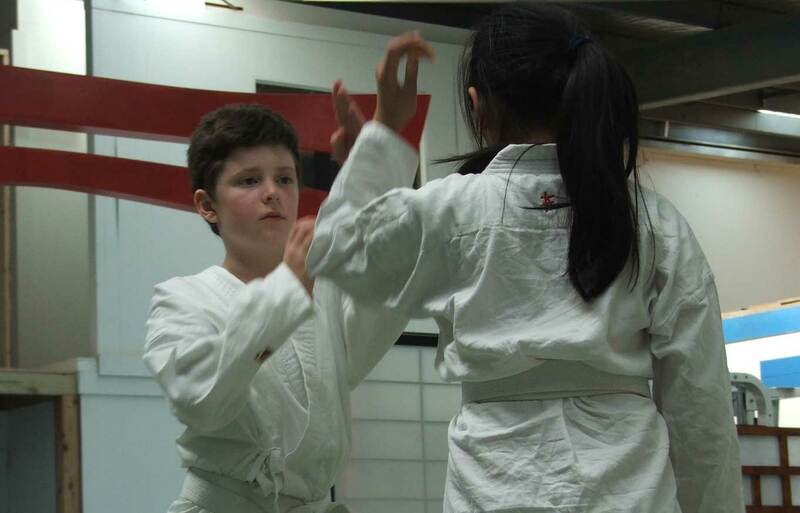 The class is friendly, energetic and fun, but kids also learn focus and self-discipline. We have students as young as six training with us. Students train together in a cooperative fashion, helping each other to develop skills, with older or more senior students helping juniors to improve while developing their own skills. This peer teaching is an important aspect of Aikido training, and aligns well with current educational principles used in schools. Students learn by teaching, and develop confidence and leadership. Classes are run in a similar manner to our adult classes (see What to expect on our New Students page) but with quicker changes of activity; more focus on fundamentals such as awareness, attacks, footwork and ukemi (break falls); and the addition of games designed to be enjoyable while still developing key Aikido principles such as balance, positioning, timing and blending. We also include a short meditation at the end of each class to aid in the development of focus, concentration, calmness and self-discipline. Parents are welcome to watch the class, leave, or relax in our lounge area. Parents who enrol as students can also participate in the kids class for free. We have generous family discounts, and remember that the first class for kids (and adults) is a free trial, so you can get a good idea of the class before you commit. 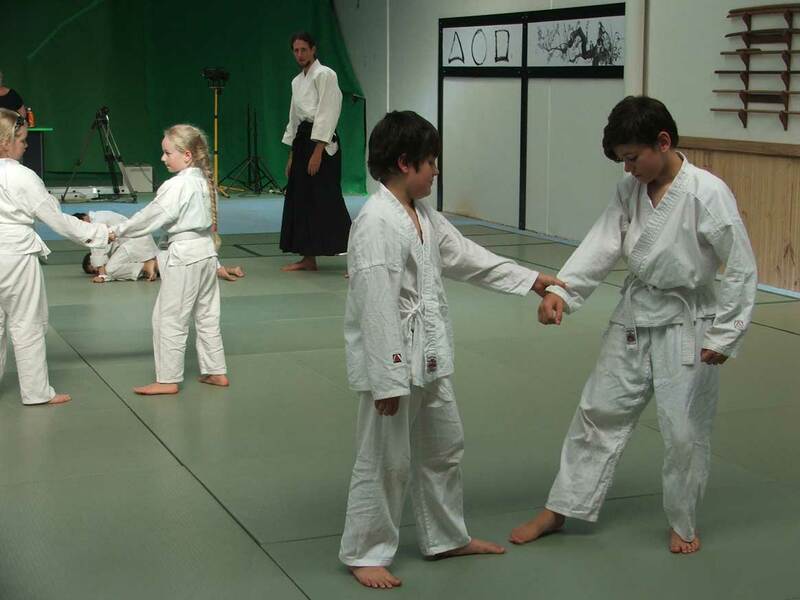 Why choose Aikido for kids? 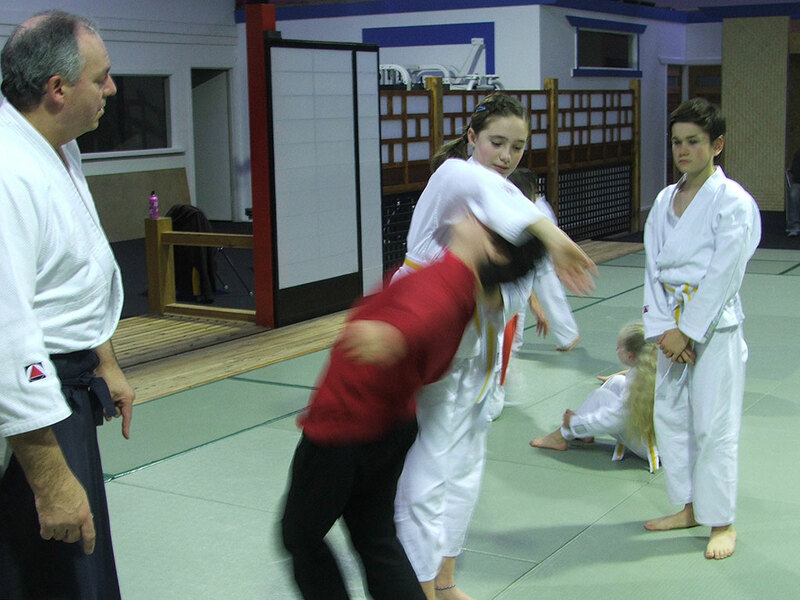 Aikido provides a variety of benefits for both adults and children. Some are particularly important for kids, such as development of focus and self-discipline, and most importantly a cooperative spirit over an overly competitive one or, worse, an aggressive attitude. By teaching a non-aggressive approach to resolving physical conflict and following a cooperative approach to learning, along with improving confidence, students gradually develop an attitude to others that helps them to get along and resolve conflict in other areas of their lives. 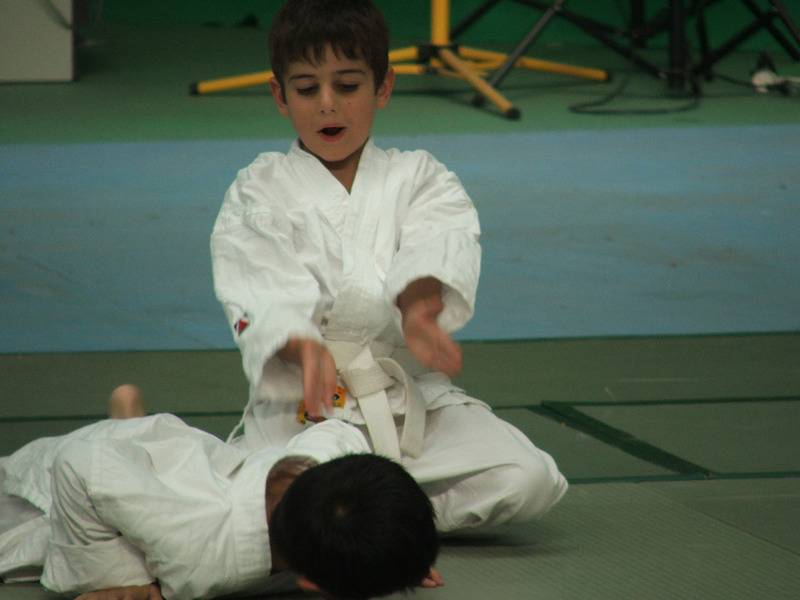 This non-aggressive attitude is probably the key reason to choose Aikido over other martial arts for children. While good teachers always tell students not to use their skills unless at serious risk, children are not always able to exercise that level of judgement or self-control. Teaching aggressive, violent techniques that can only be applied with force creates a risk that those techniques will be used – by accident or reflex, out of a desire to show off, or out of unwarranted fear or panic – and there can be serious consequences. 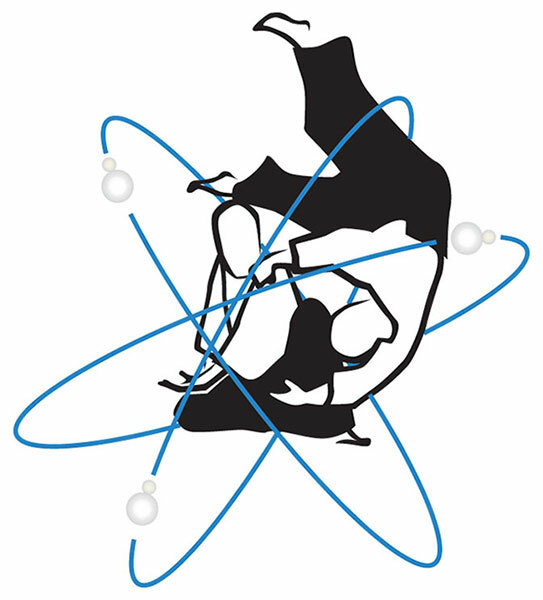 In contrast Aikido’s philosophy of non-aggression, its techniques – designed to control with minimal force or harm – and its training – cooperative rather than competitive – complement each other. To learn more about Aikido be sure to read About Aikido and About ki fusion, as well as exploring our Articles for more in depth discussion. Aikido teaches you to avoid or de-escalate conflict, and if necessary to defend yourself against aggressors. Breakfalls can save kids from falls in a variety of circumstances. Training in Aikido develops an assertive but non-aggressive attitude free from ego, which assists in getting along in daily life. It promotes flexible thinking, creative approaches to problems, and teamwork. Students leave training feeling great, with less stress and a calm, concentrated awareness. Over time worries become easier to place in perspective. Kids are able to perform under pressure, for example in tests. Aikido is foremost about improving yourself as a person. Aikido kids are less likely to get involved in fights because they are better at getting along and not taught to be aggressive or competitive. Kids on average are less active than ever before. 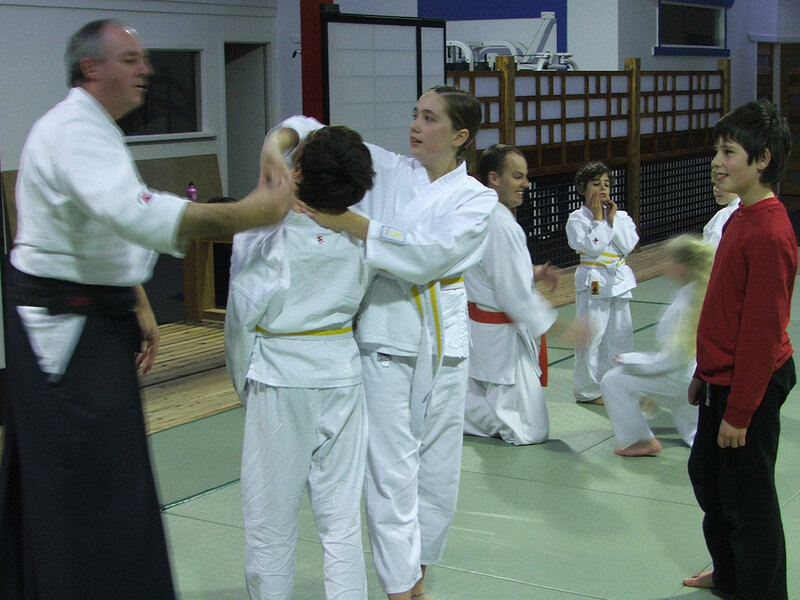 Aikido improves fitness levels in a friendly, cooperative atmosphere. Students in the kids class progress through the Junior Grading System. 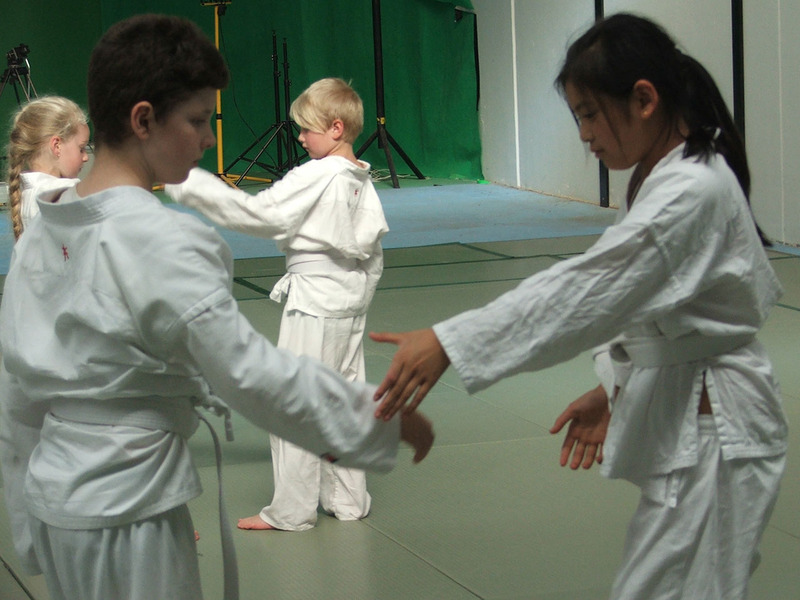 Beginning with a white belt (ungraded) they quickly acquire enough basic skill to undertake the first grade – 7th Kyu Ho – usually in a term or less. The ho grades are half grades, somewhat less formal than full grades, and can be considered preparation for the relevant full grade. After the first grade students progress to 7th Kyu Junior, then 6th Kyu Ho, 6th Kyu Junior and so on up to 1st Kyu Junior, the highest junior grade. Students receive sew-on badges for their gi (training uniform) at each ho grade and a striped coloured belt at each full grade. The first badge/belt is yellow, then orange for the 6th Kyu grades, finishing at Brown for the 1st Kyu grades. 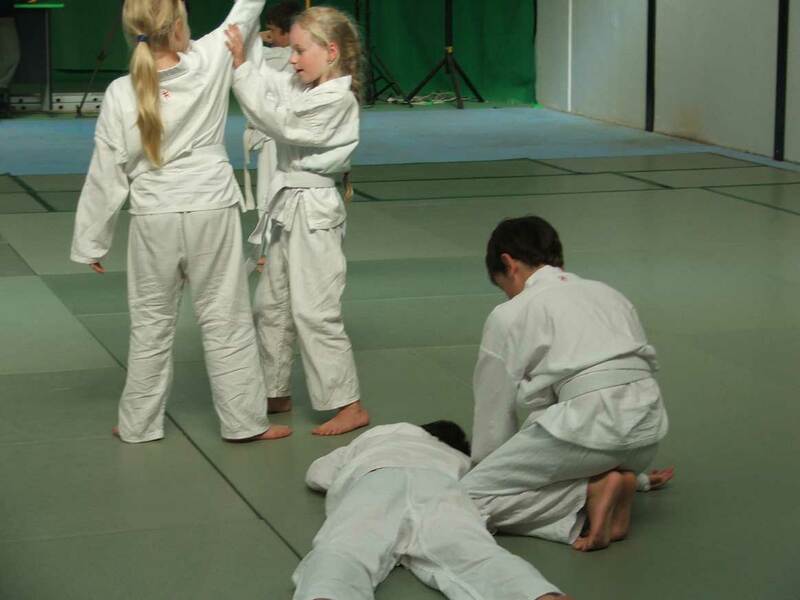 We have a policy of not awarding black belts to students under 16 years of age. This is due to the unrealistic connotations and expectations – almost a mystique – surrounding the idea of the ‘black belt’ in the minds of many westerners. In reality a black belt is a new beginning, and requires a humble attitude to prevent problems of ego which can get you into trouble. 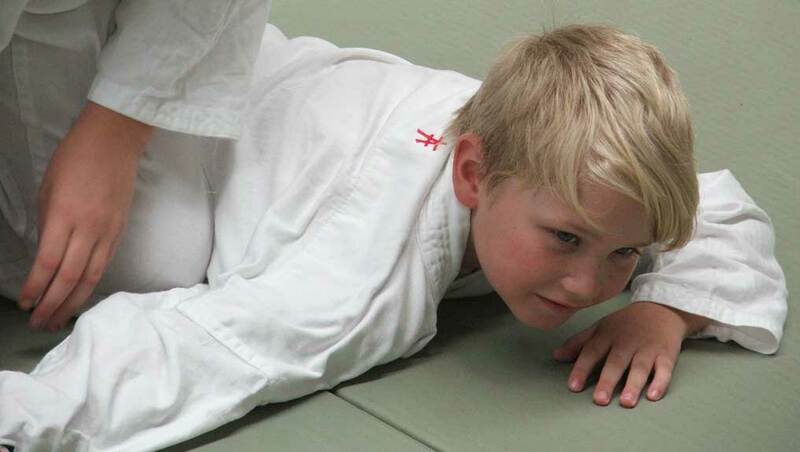 We believe that awarding children a black belt risks them developing an unrealistically inflated view of their own abilities, and perhaps a desire to show off. This is not safe from a self-defence point of view, and not good for self-development. While our adult classes are generally for students 16 years and over, we have in the past had younger students training in the senior classes, with great success. Jaydn McRae began training at the age of 8, with adults (before the kids class existed) and is currently a black belt and occasional Instructor. New students in their teens who may prefer to train with the adults should consult with their parents and the Head Instructor to make a decision. 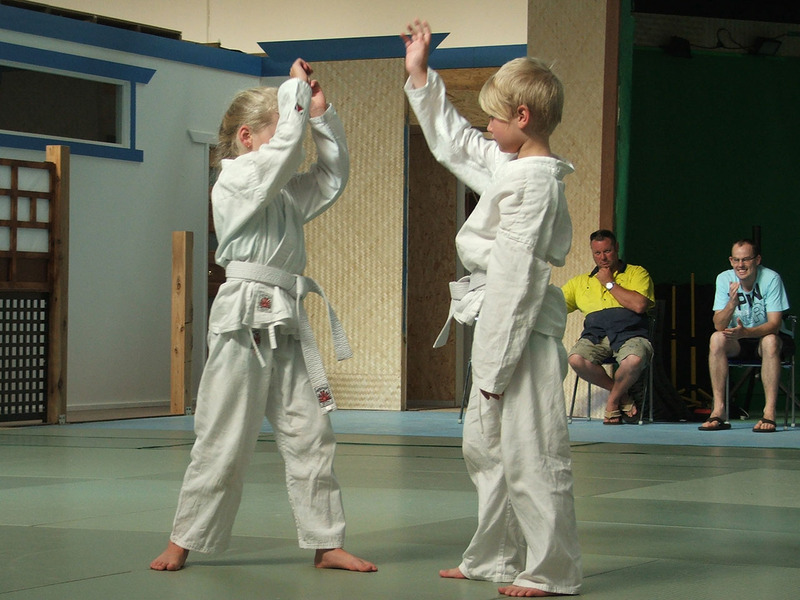 Students who have trained and graded in the kids class may also benefit from transitioning to the adult class. This is assessed on an ongoing case by case basis, in discussion with the student and their parents, when they reach high school. Some students have initially trained in the adult class for a shorter time (eg one hour) and/or have attended occasionally initially while still attending the kids class. Adult students are always careful with each other, so safety risks are not increased. After transitioning to the adult classes, students will enter the adult grading system, which is similar but of course continues past 1st Kyu to Black Belt grades. Junior belts are coloured using a stripe, while adult belts are solid colours. The grades do not correspond exactly as the Junior equivalent grades (eg 7th Kyu Junior compared to 7th Kyu) are somewhat simpler with an emphasis on basics. Therefore students should not expect to convert their Junior grade directly, but nor will they have to ‘start again’. The Head Instructor will determine at what grade the student will enter the Senior Grading System on a case by case basis, by observing their ability and knowledge over time. Grading Examinations are not highly formal in the lower grades, and students are set up to succeed – students are prepared well and if they are not ready, they will not be recommended to grade. We understand that younger students in particular may find it very difficult to remember Japanese terms or may have ‘mind blanks’ on the day, so we offer some guidance if necessary and as with adults the grades are awarded partially for performance on the day, but also for ability observed by the Instructor in training. Nevertheless the Grading Examination is good practice for kids to perform under pressure, which will serve them well in other tests at school and throughout life.